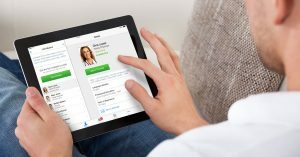 Towers Watson predicts that by 2018, 80% of employers will offer a telehealth benefit to their employees. This projection is in stark contrast to 2014, when just 22% of employers had adopted telehealth, and the close of 2015, which marked a further rise to a third of employers offering the benefit. Clearly the trend is growth, but what is the story behind it? At American Well, we set out to answer this question, fielding a broad survey of over 240 employers in Q4 2015. Our survey took a close look at the drivers of growth, as well as what employer telehealth looks like today—from use cases to the structure of the benefit to utilization—and what the benefits experts we surveyed envision it will look like in the near future. Importantly, our survey yielded insight that is not only relevant to this market, but to the health plan and health system sectors as well. 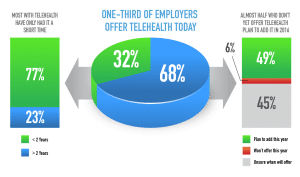 Our survey contained key questions such as which employers offer telehealth today, how long these employers have had the benefit, and for those that don’t yet offer it, when they plan to add it. Despite telehealth being a relatively new benefit for most employers, adoption is on the rise. 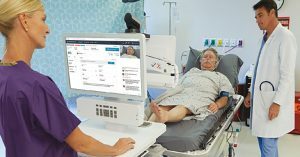 These priorities point to both a clear belief in quantifiable ROI and an understanding of the more qualitative benefits of a telemedicine offering. For a more in-depth look at each of these factors, download our free eBook, which summarizes the findings of this benchmark study. While urgent care remains a priority for employers, both today and looking toward the future, our survey revealed that employers are remarkably forward thinking when it comes to services they offer through telehealth. Looking ahead, we see even more creativity, with a desire to launch asthma counseling, lactation support, occupational health, and more specialized services using telehealth as a vehicle. Employers are acutely aware of the need to make the benefit attractive, and to that end, they use strategies such as low co-pays, telehealth kiosks, and integration of telehealth with existing services. Many still are challenged by low utilization rates of the benefit in these early days, but there are certainly solutions here. 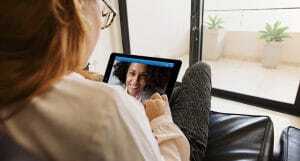 Experienced telehealth companies like American Well can help employers market the service to their employees and even provide tailored communications and creative digital and print campaigns to drive engagement. On top of these best practices, employers benefit from working with companies that offer utilization reports and best practices. Now is the time for telehealth—with our survey and others confirming growth in the employer market, there is no doubt that those employers who delay risk becoming viewed as laggards. And the same goes for the health plans, private exchanges, and health systems that depend on relationships with these employers. 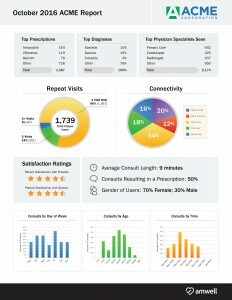 Employers want telehealth—and not just a neat, out-of-the-box urgent care offering, but a nimble platform that can support infinite use cases and promote the many healthcare goals of their unique populations. Download the eBook today for more on market impact. For more information on the employer market, visit our online Resource Center.